Small - €47.99 Large - €47.99 Only 4 left! X-Large - €47.99 Only 1 left! A wise man once told us that the basis of all art is translation. Or that’s what we think he was getting at, because he insisted on communicating solely through elaborate poses and hand gestures! At first, we thought the mystical mute in front of us was asking one of those riddles that you can only solve with a clever pun. But when he refused to whisper any hints, we decided that we were probably overthinking it! 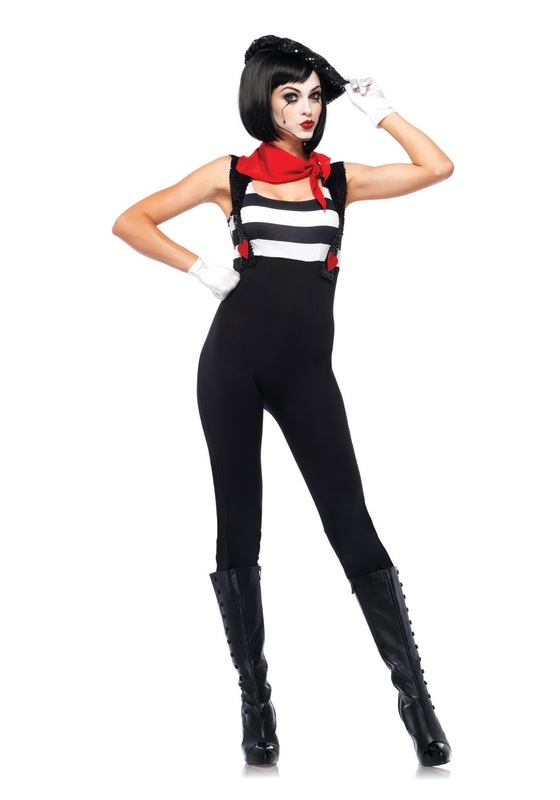 Listen: we enjoy watching a grown man pretend to feel around for the door in an invisible phone booth just as much as the next person, but the things we like best about mimes are their stylish outfits and the way they remind us vaguely of Paris. So maybe they’re speaking volumes with all that silence, revealing to passers-by the tragic futility of trying to hear and be heard through the blaring tumult of modern society and culture. Hey, good for them! We all need a hobby. And our favorite hobbies all give us the chance to walk a mile in somebody else’s shoes. So we love wearing costumes like this Marvelous Mime Costume, which lets anybody strike a different pose in a distinctive uniform inspired by a long and proud tradition of minimalistic performance artists. The sparkly, suspendered catsuit with attached striped top will make even simple moves look flashy, and the black sequined beret and bold red scarf will a dash of color, class, and whimsy! Très bien!